All transactions are safe and secure with a reliable history in online purchasing behind each of our associates. Buy the Alice in Wonderland Wonders & Madness t-shirt to own Alice in Wonderland clothing and merchandise. This design displays the evolution of Alice, including the darker Alice seen in American McGee's Alice video game. Bring along the White Rabbit as you battle the Red Queen and feed your head. Wear it under your reversible Cheshire Cat hoodie. For more Alice in Wonderland merchandise, like a Cheshire Cat plush or Alice doll, check out the products in the gallery. 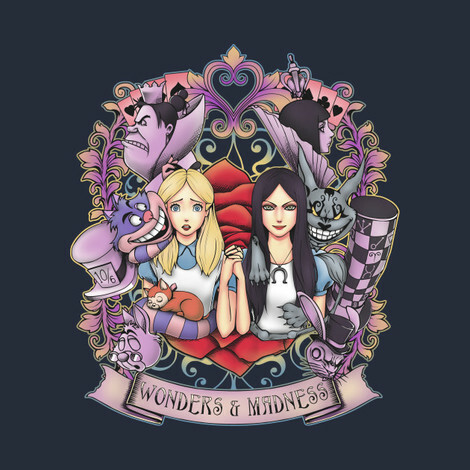 In addition to the Alice in Wonderland Wonders & Madness tee above, browse the Alice in Wonderland Clothing Gallery for more apparel like men's and women's clothes, kids shirts or hoodies.